The Ausf.M then got additional sideskirts for the chassis and turret. Also a new muffler system was introduced which allowed deep fording up to 1.3m deep water. 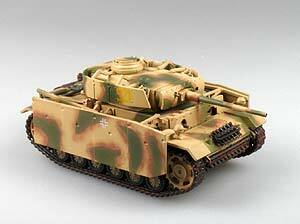 The Ausf.M was produced from September 1942 to February 1943 with 517 vehicles. The armament was still the 5cm KwK L/60 84 rounds stored inside the tank plus one 7.92mm MG34. It consists a crew of 5 soldiers. The engine was a 285hp Maybach HL 120 TRM and allowed a maximum speed of 40km/h. The tank was 6.41m long, 3.41m wide and 2.50m high. Its combat weight was 22.5t and it ran on the 38cm wide Kgs 61/400/120 tracks. The SS Division "Totenkopf" was raised initially in October 1939 in Dachau and was put together from three Totenkopf Standarten, Allgemeine SS, SS-Heimwehr Danzig and other SS units. It first fought in 1940 in France and was there as security troop until 1941. With the start of operation Barbarossa it crossed the border to Lithuania and secured the area. Lateron it moved to the area of Demjansk. In october 1942 the Division was ordered back to South-France to refresh. In November 1942 the Division was renemed to Panzergrenadierdivision "Totenkopf" and got new men and material. In January 1943 the Division was ordered again to the Eastern Front under the command of 4.Panzer Armee to fight in the area of Charkow. From April to June it fought near Bjelgorod and was the part of Operation Zitadelle where it took part at the battle of Prochorowka. In October 1943 the Division was again renamed - this time to 3.SS Panzerdivision "Totenkopf". It fought under Heeresgruppe Süd in Kriwoi Rog and Cherkassy until March 1944. Then under Heeresgruppe "Südukraine" and Mitte it fought in the areas of Kischinev, Bialystok and Modlin. With beginning of 1945 it pulled back to Hungary and Austria where they were ordered to move westward but were captured and handed over to the Red Army on 14th May 1945.